This article relies on publically accessible media and archival documents—texts that often convey the dominant ideological tone, even within commonly perceived “neutral” sources (for example, government reports or “objective” journalists). Media that has informed the article include long-since declassified FBI and CIA files, transcripts of speeches, Canadian conference documents, archives from clearly identified institutes, as well as archived and contemporary news reports. Using these primary and secondary sources, the intention here is not restate all that which can be found in extant chronologies but to consider the context in which this information arises. The first section of this retrospective essay will begin by situating Israeli nuclear development within its early historical context and national mythology. It naturally includes Israel’s public emergence as a militarized nuclear threat during the Six Day War. It will then look at Israel’s collaboration with the apartheid government of South Africa on procuring uranium, the diversion of uranium from the United States, and exchanging technological expertise with other allies. The second part of this article will look at the ongoing Israeli implementation of radioactive materials in weapons and zones attacked during military operations, including Lebanon in 2006. It will then focus on the role of secondary sources of refined uranium, like the agricultural phosphate industry, for the production of nuclear arms. It will also look at how the nuclear and phosphate/chemical mining industries in the Negev Desert play into Israel’s colonial project, illegal settlement of the West Bank, and persecution of Bedouin peoples in the Negev. This text owes a great deal to the archival efforts of Israeli-American historian Avner Cohen, who compiled interviews with key Israeli officials relating to the early days of Israel’s construction of the Dimona reactor. Cohen’s work is unique in North American media as an Israeli voice critical of Israeli nuclear arms proliferation. Cohen has maintained criticism not only of the historical events of the Israeli nuclear program, despite his description in 2003 of Golda Meir’s decision not to deploy a nuclear bomb in the East Sinai in 1973 as demonstrating “to the world that Israel was a responsible and trusted nuclear custodian.” Cohen’s interviews are compiled in an archive at the Wilson Centre Nuclear Proliferation International History Project, which is sponsored by the Carnegie Corporation and in part by the New York-based Leon Levy Foundation, a philanthropic organization supporting humanities and projects around Jewish culture. Historical events quoted in Cohen’s interviews and the documents he has collected, as well as other sources in this text, are predominantly fragmented across government websites or written about with an episodic approach to Israel’s nuclear ambitions. Another debt is held by Hannah Arendt’s Eichmann in Jerusalem which holds parallels between the creation of the “Jewish State” as a Nazi solution to the Jewish question, into the present catastrophe of the Jewish State of Israel that advocates for the ethnic cleansing of Palestinians and the displacement of Bedouin from their homelands. A porous mythology has been spun around Israel’s colonial project. The burden of historical sorrow in Arendt’s work is amplified so much more as we fall prey to a cultural amnesia erasing the greatest threats to our shared humanity. Indeed, the same patterns are playing out, though with a distinct shift of face. In his 1969 film, Porcile ("Pigsty"), Italian filmmaker Pier Paolo Pasolini depicts the “ambiguity of good and evil”, the sin of silence, and the corruption of the possibility for goodness—albeit in the form of an enlightened bourgeoisie. Through cowardice and self-absorption, a natural striving for justice becomes incapacitated, unable to confront the blatant evil it exists within and is a part of. In Porcile, we find reflections of the explicit fascism of the Third Reich contrasted against suggestions of a new, “transformed” Germany, and a “mysterious rival who rose from nothing,” the post-industrialist rise of a clean-cut and suave capitalism, a world of shiny Things. One is easy to identify—it does not conceal its mad, lunatic evil. The other is a slick caricature of a sharp-tongued Wall Street elite, a well-intentioned businessman invested in the betterment of humanity. When Signore Herdhitze mockingly remarks to the aesthete Signore Klotz, “Ah, the ambiguity of evil,” we know the nature of evil as always changing appearances, taking on the face of its victim even as it slays. But while Pasolini’s vision saw the consumption of humanity’s more honorable aspects by the emergence of a post-industrial capitalism, the same osmosis of noble qualities under a different face plays out today—that of the unravelling nuclear dream of a militaristic Zionist power that, like the brute and “innocent” pigs of Porcile, devoured humanity with total disinterest. And, as Herdhitze and Klotz well know, ambiguity preserves evil; silence is complicity. Israel is known for having two nuclear reactors, though both have been criticised in the past decade for having outlived their projected operational lifespans, and one is known to have over 1,500 structural defects. The Soreq Nuclear Research Centre, located just west of the town of Rehovot in the north of Israel, focuses on “civilian” nuclear applications in medicine and “contains the National Photonics and Electro-Optics Research Center, and SARAF–Soreq Applied Research Accelerator Facility, a versatile particle accelerator.” Soreq’s light-water nuclear reactor, and the uranium that was used to power it in its first days, was gifted by the United States in the 1960s for “peaceful purposes.” Shut down in 2018, the reactor is being replaced by a German particle accelerator, which will create “radioactive isotopes for medical purposes,” specifically palladium-103. Israel’s second reactor, located in the Negev, is the Dimona, which means “imagination” in Hebrew, formally known as the Negev Nuclear Research Facility.1 Construction on the Dimona reactor began in 1958. It went online in the early 1960s. Dimona is now widely acknowledged to have the capacity to develop military-grade plutonium and nuclear weapons, although the Israeli government under Netanyahu has retained its historic ambiguity regarding its nuclear weapons capacity and arsenal. Airbases and storage facilities speculated to be part of Israel’s military nuclear infrastructure include the Nevatim air base in the Negev, the Tirosh storage facility for nuclear weapons near the Tel Nof military airbase at Rehovot, the Eilabun storage facility for Jericho missiles, and the Sdot Micha airbase that is reportedly the “primary storage and deployment site” for Jericho I and II missiles, located a few kilometres north of the Tel Nof airbase. Additional Israeli underground storage facilities have been developed in partnership with the United States. Walter Pincus reports for The Washington Post that in 2012 only U.S. contractors were permitted to bid on a construction contract for an underground facility at an air force base near Tel Aviv, “oddly named “Site 911.”” This contract, Pincus writes, was part of a legacy of American construction projects for the IDF: "The 1998 Wye River Memorandum between Israel and the Palestinian Authority has led to about $500 million in U.S. construction of military facilities for the Israelis, most of them initially in an undeveloped part of the Negev Desert. It was done to ensure there were bases to which IDF forces stationed in the West Bank could be redeployed." During the Cold War, details of global nuclear projects remained shrouded in dramatic secrecy. The polarity of American and Soviet competition for nuclear power was defined under the American presidencies of Eisenhower, Truman and Roosevelt, and the Soviet government under Khrushev and Brezhnev. Israel’s development of nuclear weapons was similarly cloaked in mystery as its capacity emerged in the 1950s. It was only in 1981 that any Israeli official had come close to publically and explicitly confirming the existence of an Israeli nuclear arsenal. The New York Times reported the claim made by Israel’s Defense Minister at the time, Moshe Dayan, that Israel had the capacity to build an atomic bomb: “we can do that in a short time.” The Times wrote, “It was believed to be the first time that any Israeli holding or having held a position of authority had confirmed what has long been widely assumed about Israel's nuclear capacity.” Dayan is further quoted as saying, “if the Arabs are willing to introduce nuclear weapons into the Middle East, then Israel should not be too late in having nuclear weapons too.” The same article reported several instances of Israeli censorship throughout 1980, including banning “the publication of a book by two Israelis” on the subject of Israel’s nuclear development, and rescinding press accreditation for “a part-time reporter for CBS Radio, Dan Raviv” who reported from Rome on Israel’s joint nuclear test in 1979 with South Africa. A prominent case of whistleblowing from within Israel’s nuclear facilities involves Yitzhak Yaakov, a former IDF Brigadier General who was responsible for Israel’s early weapons research and development. Yaakov disclosed Israel’s preparations to deploy a nuclear weapon in the Sinai during the Six Day War to his contacts and in a draft of his memoirs—this plan would become known as “Operation Samson.” The former General was arrested in 2001 and in the following year was convicted for “harming national security” for “two books he wrote in the last few years—a memoir and a novel that, according to the prosecution, contained real data.” He died two years after his conviction. His central role in Israeli weapons research and development meant Yaakov acted as a “senior liaison between the IDF and all the civilian defense Research and Development (R&D) entities” during the Six Day War in 1967—or “the humiliation of Suez,” as French nuclear scientist Bertrand Goldschmitt referred to it—when Israel would emerge as a clear nuclear threat. The limited literature on Israel’s nuclear weapons is generally focused on the questions of “do they have them” and “will they use them.” An argument against the development of nuclear weapons on principle is rare, as is a critique of the nationalistic and genocidal tendencies of Zionism that informed both Israel’s historical development of nuclear power, and the threat its military industries pose both to human life and the environment of the so-called Biblical homeland. This article examines the disclosure and the silence, the language used, and the trail of very public documentation around a great, ambiguous evil—the art of justifying the means of war. An evil that is not necessarily manifest in the form of a “final solution” of a nuclear bomb—the nuclear question is only one facet of a greater criminality, the sickness of a manic Samson. Production model of nuclear weapons core. 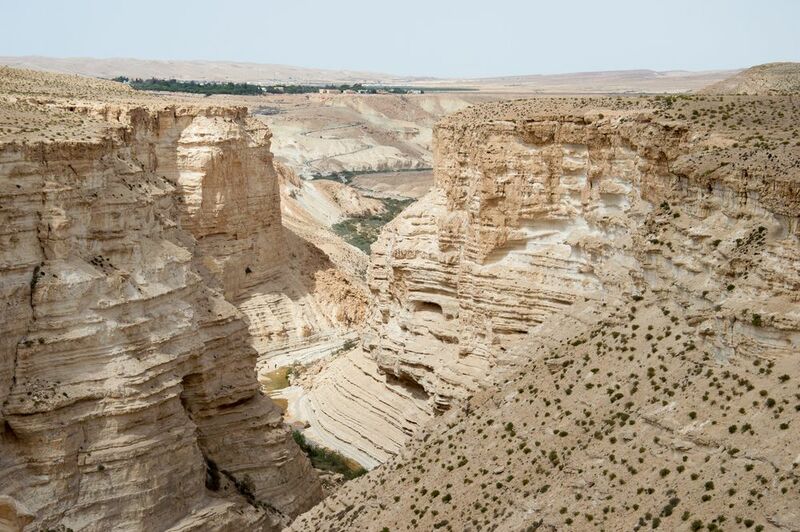 The Negev Desert is located in southern Israel, spanning the West Bank and the Jordanian border in the east, and the Gaza Strip and Egypt to the west. The Negev continues to be a frontier for new Israeli settlements, with the expansion of resource extraction industries dominated by the private company Israeli Chemicals Ltd., the expansion of military facilities for the Israeli Defense Forces (IDF), and relocation of private weapons manufacturers like Uzi-maker IMI.4 Geological surveys began targeting the Negev in the 1950s, when Ukrainian-born nuclear scientist Israel Dostrovsky created the Hemed Gimmel (later renamed Machon 4), a special unit of the IDF’s Science Corps to conduct a mineral survey of the Negev for sources of uranium. Dostrovsky, who was described as embodying “[Prime Minister] David Ben-Gurion's ideal of the Zionist scientist—a researcher who divided his time between science and security,” headed the Weizmann Institute’s isotope research department for seventeen years. In the 1960s, Dostrovsky also served as Director General of the Israel Atomic Energy Commission (IAEC). Established in 1934 in the city of Rehovot, south of Tel Aviv, the Weizmann Institute is a research institute for “natural and exact sciences.” One of the functions of the Weizmann Institute in Rehavot was processing heavy water, which is used to make weapons grade plutonium. It was also, as former President of the Weizmann Institute Haim Harari described, a “niche product, which is used for medical purposes.” The Weizmann Institute also operates a commercial branch called Yeda Research and Development, which “holds an exclusive agreement with the Weizmann Institute to commercialize the unique intellectual property developed by the scientists.” In 1954, Machon 4 researchers were relocated from their base at Dimona to the Weizmann Institute. The physical relocation of the Machon 4 IDF division blurred the distinction between the explicit military means of the Hemed Gimmel and the public research institute that would become essential in the foundational years of Israel’s nuclear program. It exists to this day under the auspices of “Science for the Benefit of Humanity.” This murky affinity between the IDF and public research institutes would become characteristic of Israeli technological development in a way that seemed to celebrate interdisciplinarity and “creativity,” but which, far from alleged humanistic aspirations, served the interests of a religious, military state. The Weizmann Institute was first established in 1934 as the Daniel Sieff Institute by English-Lithuanian businessman and member of the Zionist Commission, Israel Sieff and his wife, Rebecca Sieff. It was initially named after their son. Israel Sieff had cultivated connections with British Lords and businessmen like prominent Zionist supporter Lord Marks of Broughton. When he was named the chairman of Marks and Spencer in 1964, The New York Times referred to Sieff’s relationship with Belarusian born Zionist and biochemist Chaim Weizmann, "Mr. Sieff, who became vice chairman of Marks and Spencer shortly after Lord Marks moved into the chairman's seat in 1961, has had, like Lord Marks, a great interest in Zionism. Once, before World War I he lent $5 to Dr. Chaim Weizmann. He has given a good deal more to Israel. A Zionist since boyhood, he was once quoted as saying that business was his hobby and the Jewish people his business." Rebecca Sieff was herself a Zionist campaigner, member of the Daughters of Zion, founder of the Women’s International Zionist Organization, cofounder of the World Jewish Congress, and advocate for “pioneers” in “rebuilding Palestine.” The Zionist Commission spread nationalist propaganda for the formation of a Jewish state in Palestine and support for mass immigration of Jews into this new homeland. The Commission brought their campaign to European Jews, appealed to “non-national, non-political, non-Zionist” “Arabized Jews” who were living across Greater Syria, and campaigned among Jews living in the British colony of Mandatory Palestine.5 As a wealthy campaigner for the Zionist Commission, Daniel Sieff himself was notably part of a survey mission to Palestine in 1918, in anticipation of the Balfour Declaration that mandated British support for the creation of a Zionist state. Among the Zionists campaigning for the “emigration” of European Jews from their homes to the colonial “homeland” of Palestine was Belarusian scientist and Zionist Chaim Weizmann. Weizmann was a proponent of the Synthetic Zionism movement (which merged political and practical nationalist activities of settlement in Palestine), the President of the World Zionist Organization for over a decade, and also served as the first President of the State of Israel. Rebecca Sieff’s involvement with Zionist fundraising was purportedly kindled after she heard Chaim Weizmann deliver a speech. Weizmann eventually became the namesake for the Daniel Sieff Institute, which took its current name in 1949, and was pronounced by the Sieffs as its Founder. His scientific accomplishments included deriving acetone for gunpowder from agricultural materials like corn, which would be used by the British military. According to a report from The Independent in 1998, Chaim Weizmann developed other patents including a “novel dyestuff synthesis”: "Ironically, the company to which he sold his patent was IG Farbenindustrie, the chemicals combine which later became infamous for manufacturing the gas used in" the Nazi death camps, and which was broken up after the Second World War into the pharmaceuticals giants Bayer, BASF and Hoechst." At the time the Sieffs established the Weizmann Institute and were campaigning for the Zionist Commission, the project of establishing a “Jewish homeland”—der Judenstadt—was finding an unlikely affinity with a solution for “the Jewish question” that was proposed by German Nazis. In her book Eichmann in Jerusalem, Hannah Arendt wrote of how Carl Friedrich Goerdeler, former mayor of Leipzig and a member of the Nazi party until he resigned in 1936, claimed the Jews were in an “unseemly position as a more or less undesirable ‘guest nation’ in Europe.”7 Goerdler proposed the creation of a Jewish state to which Jews could be deported: a “permanent solution,” an “independent state in a colonial country.” Even Adolf Eichmann, whom Goerdler later opposed, had stated, “There exists only one possibility […] Give enough room into which to transfer the Jews of the Protectorate, who now live dispersed.”8 Several such Jewish homelands were proposed where Europe refused them humanity: “an area as large as possible in Poland, to be carved off for the erection of an autonomous Jewish state in the form of a protectorate,””9 and fantasy lands in colonial Canada, South America and Madagascar. To facilitate Nazi deportation and ethnic cleansing of Jews from Europe, “emigration” centres were established across Europe, such as the Reich Centre for Jewish Emigration established by Hermann Göring in Berlin, and Adolf Eichmann’s Jewish emigration centre in Prague. Arendt described how German Zionist leaders, and organizations like Aliyah Beth, worked with the Gestapo to facilitate the deportation of European Jews. One such Zionist organization is known as Youth Aliyah. Founded by Recha Freier and her husband Shelheveth Freier on January 30, 1933, the official day of Nazi ascent to power in Germany, Youth Aliyah took on the mission of deporting young European Jews to illegally settle in Mandatory Palestine, even before the formation of the Israeli state. Despite both the real life-saving effect resettlement had on young European Jews under the fascistic governments of their homelands, organizations like Youth Aliyah10 contributed to the normalization of anti-Semitic policy against Jewish Europeans. The words of Spender and Harari present an idyllic image of the Weizmann Institute, a utopian environment where the sciences are in direct conversation with the humanities. But much like the relocation of the IDF’s Machon 4 chapter into a public research institute, this institutional diffusion also makes the distinction less discrete between the eventual “peaceful” and military applications of research. When practiced within the institutions of an apartheid state, “pure” and “disinterested” science, or science for “its own sake,” requires no obligation from scientists to be concerned with its ultimate ends, be they in medical diagnostic tools or in the development of atomic bombs. We have only to remember the accomplishments of Fritz Haber, the German physical chemist who developed the cyanide-based Zyklon-B, a pesticide and disinfectant that was used to exterminate millions of Jews in Europe, as well as phosgene, chlorine gas and dichlorethyl chloride (mustard gas), which anticipated the proliferation of chemical weapons. Haber commented on the efficacy of developing chemical weapons, “All modern weapons, although seemingly aimed at causing the death of the adversary, in reality owe their success to the vigor with which they temporarily shatter the adversary’s psychological strength.”xlv By the time Haber and his associates were forced to leave their positions by Nazi decree, he had an established connection with Chaim Weizmann. “Weizmann, preoccupied with establishing Jewish academic institutions in Palestine, visited Haber in Dahlem in 1932–and was impressed by Haber’s Institute to the point that he modeled the Sieff Institute on Haber’s.”xlvi The Weizmann Institute at Rehovot also contains Haber’s collection of books at the Fritz Haber Library, so named in January 1936. Just as US Secretary of State Henry Kissinger was awarded an honorary degree by the Weizmann Institute, and honoured “as a messenger of peace and “the principal architect of international conciliation,” the institute even offered Haber a position in the 1934, a trip to the “Garden of Eden” that was never realized before his death that year. The original Israeli plan for a small reactor near the Weizmann Institute, discussed with France in 1956, culminated the following year in an agreement for a medium-sized, production scale reactor for weapons grade plutonium, known today as Dimona. By the time the agreement was signed in 1957, Israel had increased its intended production from an initial sum of ten to fifteen kilograms of plutonium a year to more than forty, a capacity that qualifies as military production. The collaborations between French and Israeli scientists—initially without direct connection to Israel’s intention to construct a nuclear reactor with military capacity—ultimately contributed to France’s decision to sell nuclear technology to Israel. This exchange between France and Israel also set a precedent for other international collaborations through R&D that Israel pursues today through institutes like the Israel Innovation Authority, and the Canada-Israel Industrial Research and Development Foundation. The Weizmann Institute frequently receives financial support and institutional partnerships through the Israel Innovation Authority, and the Canada-Israel Industrial Research and Development Foundation (CIIRDF). Weizmann’s Montréal branch is located in the upper-class neighbourhood of Westmount, in the vicinity of other Israeli institutes and non-profits like the Zionist Organization, Israel Aliyah Centre, the Canadian Association for Labour Israel, and the Association for Soldiers of Israel (“the only non-profit organization in Canada supporting the wellbeing of Israeli soldiers on active duty”). Described on its website as “part of a worldwide network of supporting organizations” for the Rehavot-based Institute, the Montréal branch of the Weizmann Institute acts as a charity for the Israeli research institute, registered under Imagine Canada, a “charitable umbrella organization” whose funders include the Royal Bank of Canada, TD, and Suncor. Current president of the Weizmann Institute is Belgian-born Daniel Zajfman: "Zajfman also has strong ties with Germany. Since 2001 he has been an external member of the Max Planck Institute of Nuclear Physics in Heidelberg, where he was appointed a director in 2005. He found that science was an excellent means of overcoming political tensions among Israelis and Germans. 'The diplomatic story between Israel and Germany started with scientists,' he says." Shimon Peres described Israel’s first Prime Minister David Ben-Gurion, as well as himself, as “enthusiasts” of nuclear energy, simultaneously describing the early nuclear pursuits of the Israeli state as “peaceful” and claiming that nuclear deterrence was “the first step on the path to peace.” Israeli physicist and co-founder of Youth Aliyah.14 Shelheveth Freier remarked in his 1987 interview on Israeli policy towards “nuclear non-proliferation”: "I think nowadays the requirements are not the requirements, are not very stringent for anyone who has a nuclear industry, who has a—in fact I might quote the Director General of the International Atomic Energy Agency, Dr. Blix, who I believe said that any country which has a necessary scientific and industrial base can produce, if it wants to, nuclear weapons." The year after the formation of the Israel Atomic Energy Commission, U.S. President Dwight Eisenhower delivered an address to the United Nations Security Council. Called “Atoms for Peace,” Eisenhower acknowledged that the United States and the Soviet Union no longer held global monopolies on nuclear power as they once had. Suddenly, the pursuit of peaceful applications of nuclear power became a public relations priority. On December 8, 1953, Eisenhower called for the formation of an international atomic energy agency that would operate through the United Nations, and would oversee a uranium bank to which governments could make “joint contributions from their stockpiles of normal uranium and fissionable materials.” As Eisenhower claimed:The more important responsibility of this atomic energy agency would be to devise methods whereby this fissionable material would be allocated to serve the peaceful pursuits of mankind. Experts would be mobilized to apply atomic energy to the needs of agriculture, medicine and other peaceful activities." By the time Eisenhower delivered his speech, there had already been significant changes to nuclear agreements that existed between the United States and its allies. A decade-old secret pact with Canada and Britain, signed in Quebec in 1943, declared that the parties required mutual consent on disclosing nuclear technology or providing materials to third parties. This was followed by the Atomic Energy Act of 1946, which shrouded the entire American nuclear program in secrecy. A further revision to the U.S. Atomic Energy Act in 1954 allowed Washington to declassify and disseminate unclassified nuclear information with private companies—to “strengthen free competition in private enterprise.” The Act stated that atomic energy would be “directed so as to promote world peace” while “making the maximum contribution to the common defense and security.” The Act however, allowed Israel to divert American aid towards developing its military nuclear power. This was revealed in an FBI investigation called “DIVERT” that detailed how Israel diverted uranium from the NUMEC Plant in Apollo, Pennsylvania. The International Atomic Energy Agency was officially founded in 1957, four years after Eisenhower’s speech, under the directorship of U.S. Republican politician William Sterling Cole, and now oversees global safeguards and compliance with international nuclear protocols in place for “peaceful” development of nuclear energy. The Treaty on the Non-Proliferation of Nuclear Weapons was opened for signature by the United Nations in 1968. Safeguards and compliance to this Treaty are overseen by the International Atomic Energy Agency (IAEA). Israel has refused to join the Non-Proliferation Treaty on the basis that other Middle Eastern countries have, and continues developing nuclear weapons under the auspices of “peaceful” uses for atomic energy. This means that it cannot import highly enriched uranium that is subject to UN oversight. In a documentary by the WGBH Media Library and Archives, Shelheveth Freier argues that: "No European country is responsible for its own security, because they all are tied together in NATO, and they have the American... under American umbrage, which is both nuclear and conventional […] You see that you have your own bombs, you have other people's bombs, you are, you're a good boy, having signed the Non-Proliferation Treaty, you are not even responsible for your own defense entirely, and then you preach others, and tell them to sign the Non-Proliferation Treaty... you just wonder just how much force there is in this argument." Today, only five countries have refused to sign the Non-Proliferation Treaty: Israel, India, Pakistan, and South Sudan, and South Korea. As one of Israel’s most prolific trading partners in technology, India itself was only taken seriously as a nuclear threat after the explosion of its 1974 test, Operation Smiling Buddha. Canada, carrying a mythological reputation as a “peaceful” nation, supplied CANDU (Canadian deuterium-moderated) reactors to India, and prior to Smiling Buddha, plutonium is likely to have originated from the military-capacity Bhabha Atomic Research Centre in Mumbai. Goldschmitt remarked in his interview with Cohen, “Canada, and with great publicity, announced that it would give [a reactor], because it was through the Colombo Plan, to India.” Israel has been further scrutinized for its recent arms deals, including supplying military drones and surveillance technology to South Sudan, whose militia has also used “Galil ACE rifles” in genocide against the Nuer tribe. To date, Israel does not permit the International Atomic Energy Agency to inspect the Dimona reactor, and historically only permitted select scientists for non-thorough visits, though the state claims it has “voluntarily accepted to operate in accordance with the IAEA’s safety regulations. An independent commission monitoring the reactor reports directly to the prime minister.” “Many years later, McGeorge Bundy, Kennedy’s national security advisor, said that the U.S. visits to Dimona in the 1960s “were not as seriously and rigorously conducted as they would have had to be to get the real story.”” To solidify this, in July 2018, Israel passed a vote of 73 to 8 in the Knesset against the proposal of international monitoring of the Dimona nuclear facility. In the 1950s, Israel had constructed the Weizmann Automatic Computer (WEIZAC) which, as its name implies, was developed at the Weizmann Institute. The WEIZAC became the first computer built in Israel and according to Haim Harari was considered within the institute as “the legendary computer in the '50s.” Its construction was made possible by the negotiation of Lithuanian-born Zionist physicist Chaim Pekeris, who in 1945 had organized “a network of bankers, businessmen, farmers, shippers, engineers, and scientists” from U.S. and Canadian supporters of the formation of the State of Israel.lxxvi The WEIZAC computer itself is a replica of the design of the Institute for Advanced Study (IAC) at Princeton, New Jersey. Among other models based on IAC, the MANIAC computer at Los Alamos was intended for nuclear-weapons calculations,lxxvii and its “first job was to perform the calculations for the hydrogen bomb.”lxxviii Pekeris was involved in military research at the Hudson Laboratories of Columbia University, and advocated for military access by the IDF to the WEIZAC. Like Israel Dostrovsky, Chaim Pekeris had also been involved with the geological survey of the Negev for uranium deposits. In 1989, the United States denied an export license to sell a Cray supercomputer to the Technion Institute because, according to the Wisconsin Project, investigation acknowledged that scientists from the Weizmann Institute were enriching uranium and that “the university conducted research on nuclear-capable missiles.” A 1987 Pentagon-led study that had made the discovery of Technion’s nuclear development also referred to the “medical” nuclear facility of “Soreq, where scientists were ‘developing the kind of codes which will enable them to make hydrogen bombs.’” The ban on the export license for the Cray machine was later overturned, and Israel was permitted to acquire the supercomputer. 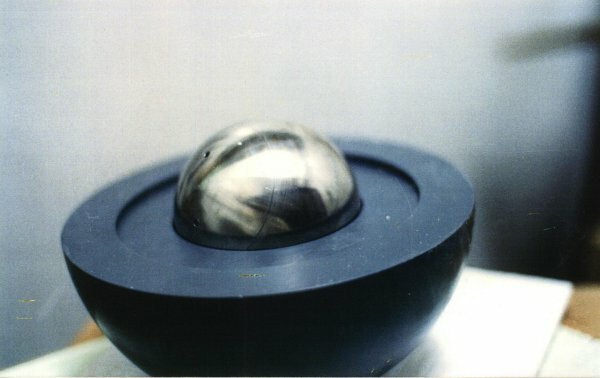 According to the Institute for Research: Middle Eastern Policy, "The 1987 IDA study documents Weizmann scientists developed a cutting-edge high energy physics and hydrodynamics program “needed for nuclear bomb design. […] According to a U.S. Department of Defense study performed by the Institute for Defense Analyses, the Weizmann Institute of Science in Israel has actively engaged in nuclear weapons research." In 1995, the United States once again supplied Israel with supercomputers manufactured by Cray Research and IBM. “The Cray machine is destined for the Inter-University Computation Center, a ‘wide area network’ that connects Israel’s leading universities, several of which are known to be working on nuclear weapons and long-range missiles.” The Wisconsin Project reported on this exchange in 1996, describing how the sale was initially voted down by “five federal agencies” due to the inability to confirm whether the machines would be employed for nuclear weapons. “The policy was that if the export is going to a proliferant and you can’t safeguard it, and it is not part of a government-to-government program, you deny it,” said a U.S. official familiar with the case. According to Cray, the negative vote by the Subgroup on Nuclear Export Controls (SNEC) was due to the fact that the machine “was going into a black hole because the site was classified as off-limits.” The recipient was “known but not trusted,” the Cray official confided to the Risk Report. The negative vote was reversed late last year by a change in U.S. export policy. 1. More recently, in 2016, Netanyahu wanted to rename the Negev Nuclear Research Centre in honour of Shimon Peres. 2. The Times of Israel reported in 2017 that comments on the structural flaws of the Dimona nuclear reactor were provided by Israeli Tourism Minister, Yariv Levin. See “Government has no plans to close aging Dimona nuclear facility”, The Times of Israel, September 19, 2017. 3. “Interview with Yitzhak ‘Ya’atza’ Ya’akov by Avner Cohen,” 1999, History and Public Policy Program Digital Archive, From the personal collection of Avner Cohen. 5. The Zionist Commission and the Jewish Communities of Greater Syria in 1919, Andrew J. Patrick, Jerusalem Quarterly 56 & 57. 6. The Fateful Triangle: Israel, the United States, and the Palestinians, Noam Chomsky. Black Rose Books, 1982. p. 51. 7. Eichmann in Jerusalem, Hannah Arendt. 8. Ibid, 80, 100, 103. 10. Youth Aliyah continues to operate “villages” for children today with funding from North American charities like Hadassah, the Women's Zionist Organization of America. 11. Eichmann in Jerusalem, 60. 12. The Question of Palestine, Edward W. Said. Knopf Doubleday Publishing Group. August 19, 2015. Page 40. 13. The Politics and Strategy of Nuclear Weapons in the Middle East: Opacity, Theory, and Reality, 1960-1991, Shlomo Aronson. SUNY Press, 1992. P. 66. Lital Khaikin is a Russian-Canadian author and publisher living in Montréal ( Tiohtià:ke ). Her literary writing has appeared in numerous publications including 3:AM Magazine, Queen Mob’s Teahouse, Berfrois, and the “Vestiges” journal by Black Sun Lit, and some of her poetry has been translated into Italian. She has contributed journalism to Canadian publications like Briarpatch and the Media Co-op, writing about industrial development, extractive industries, and militarism. Some of this work has been translated into Mandarin for the Taiwanese publication Coolloud Collective. She has previously edited with the team of continent. journal, and has participated in residencies in Germany, Austria, and Denmark. She is the founder and publisher of The Green Violin, a slow-burning ‘samizdat’-style literary press for the free distribution of poetry, essays, prose, and literary paraphernalia.